UML elements and connectors each have a standard appearance, in terms of shape, color and labeling. It is possible to change the appearance of a type of element or connector in a number of ways, using a Shape Script to define the exact feature you want to impose on the default - or main - shape. 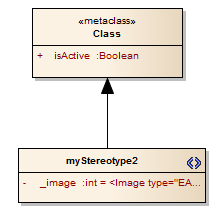 If you want to standardize the appearance, to apply to many elements, you attach the Shape Script to an attribute of a Stereotype element in a UML Profile (such as an MDG Technology UML Profile). In the 'Name' field, type '_image'. Click on the button next to the 'Initial Value' field. The 'Shape Editor' dialog displays. Enter the Shape Script in the 'Shape Editor' dialog. When you have finished writing the Shape Script, click on the OK button and then the Close button.